Firefighters rescued four people, including a young child, after a suspicious blaze started burning in the hallway of a South Shore neighborhood apartment building Monday afternoon. 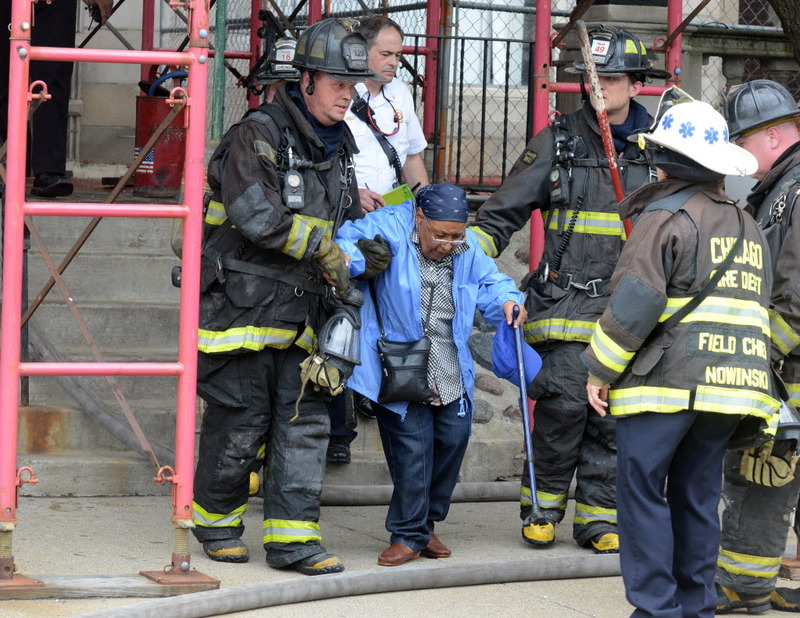 Emergency officials were called about 2:40 p.m. to a seven-story walkup in the 7000 block of South Jeffery Boulevard, Fire Media Affairs Director Larry Langford said. A woman in a second-floor unit heard her smoke detector go off and called 911 after she found a fire in the hallway in front of her door, blocking her only exit, Langford said. Firefighters put ladders up the front of the building and rescued the woman after bringing a young girl, about 4, to safety, he said. Crews also rescued two other adults from a rear-facing unit, Langford said. No one was injured. The heavy fire burned through the woman’s door, and filled the building with smoke, Langford said. The blaze is considered suspicious, and both the Office of Fire Investigations and police Bomb and Arson Unit are looking into the cause, he said. Reblogged this on The NW Fire Blog.